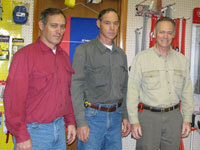 We three brothers Joseph, David, and Gurney McCabe started early in our lives working with our father at his business, McCabe's Mechanicals Inc., servicing plumbing, heating and air conditioning in residential homes and commercial entities in the Watertown, NY area. In 1984 Watertown's population was beginning to grow due to Fort Drum's expansion. We saw a need to branch out into a wholesale distribution business, consisting of specialty items in the field of plumbing, heating and industrial supplies. With a total experience of 60+ years in the mechanical field we knew what to and what not to stock for the commercial market. Being in the service and repair business for years, we knew what was needed by the maintenance personnel for the commercial entities. Today, we handle commercial boiler parts and accessories as well as electrical supplies. We cater to the HVAC market. We are a certified in house pump repair station. At McCabe's we work closely with the municipalities dealing with sewage, grinder and chemical feed pumps, hydraulic pipe and fittings. We carry an assortment of piping materials for underground and above ground applications, including waste, drainage and pressure piping. McCabe's Supply is New York State certified for testing and maintenance of Automatic Fire Sprinkler Systems in accordance with NFPA 13 codes. Also we are New York State certified for testing, maintenance and inspection of Backflow Preventers.